The Mandolinquents captured live at New Greenham Arts. occasional burst of song or fiddle. Paying a return visit to Arlington Arts, the Mandolinquents treated the audience to a brilliant display of superb musicianship mixed with their own brand of whimsical humour.This pre-Christmas show opened with a delightful version of the carol Silent Night, before they launched into the group’s signature tune The Typewriter by Leroy Anderson. This night, Simon Mayor, Hilary James and Richard Collins were joined by Elias Sibley (in the absence of Gerald Garcia) on guitar. The second half of the first set was given over to an amazingly talented harpist, Camilla Pay, and Nick Ellis, whose brilliant clarinet melodies were wonderful. Together Camilla and Nick wove their own spell over the audience with a fascinating mix of operatic melodies, film scores, and more that entranced and entertained in equal measure. After the interval the Mandolinquents with guest cellist Florence Petit joined Nick and Camilla for an ensemble performance which held the audience spellbound. I loved Down By The Salley Gardens, which is based on a WB Yeats poem, and their own arrangement of Winter, a Shakespeare poem. By way of total contrast, there was Dream A Little Dream Of Me and The Bold Fisherman, while the humour was kept up with The Snowman’s Song and a very amusing song about Rudolph’s lesser-known brother Boris. The harp solo excerpt from Britten’s Ceremony Of The Carols was stunning and The Mandolinquents proved once again that their versatility and power to entertain is unequalled. This was a perfectly pitched performance for a December evening. The Mandolinquents will be back in 2017 and will also be hosting workshops at Shaw House. Mandolins have been associated with informal music-making down the centuries and the bottom line is that this widely-acclaimed mandolin quartet don’t change that. There was nothing remotely hit and miss about their playing, however, because underpinning the laugh-a-minute informality was virtuosity and accomplishment. Solo mandolin music is virtually nonexistent. It’s most famous exposure is probably in Don Giovanni’s Serenade in Mozart’s opera, followed by two Vivaldi concertos, one of them for two mandolins. We had movements from both concertos here and a combination of Vivaldi and Sheffield’s Simon Mayor, the most famous mandolin player in the world – except Captain Corelli who happens to be at the Crucible Studio currently – showed its potential as a solo instrument. Its range and resonance might be limited but Mayor’s string plucking had flow, and even diminuendo and crescendo in the opening allegro of the single mandolin concerto. Elsewhere, items ranged from a Brazilian tango to Rachmaninov, Dvorak (Slavonic Dance No 1) to Irving Berlin (Cheek to Cheek, The Piccolino), and two Chinese tunes arranged by the group’s superb guitarist Gerald Garcia to Mozart (Rondo all Turca, first movement of Eine Kleine Nachtmusik). The two Fred and Ginger numbers featured the plaintive soprano voice of mandobass player Hilary James and Richard Collins, the second Mandolin player, wowed with his banjo-playing, especially in Little Rabbit (an Appalachian tune) in which Simon Mayor picked up the fiddle. That seemed to be an impromptu addition to the programme and, like everything, worked extremely well. Mandolinquents experience was sheer joy! Imagine an experience that takes you on a musical journey from the folk songs of the English/Scottish border to Hong Kong to the court music of Vivaldi to a melody reminiscent of the Dukes of Hazard and to an Irish tune – The Dark and Slender Boy – apparently Ireland’s ode to a bottle of Guinness. 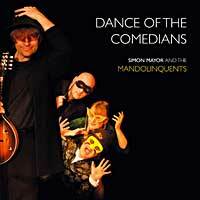 It’s not easy, but at the Electric Theatre on Monday evening these diverse musical genres combined in a captivating performance by the Mandolinquents. One of the highlights of the Guildford International Music Festival, the audience left with senses sated by the energetic and atmospheric sound of the mandolin, expertly accompanied by the classical guitar and the banjo. Humourously led by Simon Mayor, the Mandolinquents gave Carmichael’s Hong Kong Blues a subtle airing, while Vivaldi’s double mandolin concerto was given new life. The list goes on and one fears that simple adjectives will fail to explain the sheer joy of the Mandolinquents experience. This was a wondrous evening of perfectly executed music from mandobassist Hilary James, classical guitarist Gerald Garcia, Richard Collins on mandolin and 5-string banjo, and Mayor, the undisputed mandolin king. 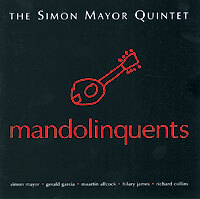 THE Simon Mayor Mandolin Quartet, more appropriately known as the ‘Mandolinquents’, mesmerised a capacity audience at the Courtyard last Thursday with superb musicianship and a zany sense of fun. Simon Mayor, Gerald Garcia, Hilary James and Richard Collins gave a highly impressive demonstration of their individual and combined skills on mandolin, mandobass, guitar, violin and banjo, while Hilary’s vocal and dancing talents added even more variety to the programme. The music, ranging from Vivaldi to ‘Fred and Gingery bits’, was performed with respect and affection whilst humorous introductions added to the delightfully laid-back atmosphere of the occasion. Gerald Garcia even interrupted the proceedings long enough to take a photograph of the audience. The encore – a spoof on ‘Home, Home on the Range’ and entitled ‘The Spider in the Shed’ – was gruesomely hilarious and reminiscent of Belloc’s ‘Cautionery Tales’. A great evening – let’s hope this marvellously entertaining ensemble will return to Hereford soon.